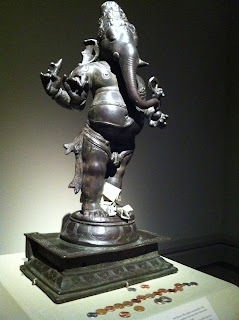 While recently walking past one of my favorite pieces at the Metropolitan Museum of Art in New York, the Standing Ganesha from 12th Century India, I couldn't help but notice that someone had left a very generous monetary offering at the feet of this popular deity. It was definitely odd, because over the years I have walked past this statue a multitude of times always stopping to admire it, and maybe...maybe... a few pennies would had been left at it's feet for offer. Normally never this much money at one time. Ganesha is believed to bestow success and abundance through his control and removal of obstacles. Before beginning a task, often an offering is made to Ganesha. Wondering if there was a Hindu holiday that could have coincided with the offering, or if this was standard practice, I consulted with one of the original co -founders of the Mind Body Spirit Marketplace, DharmaKarmaArts, who is Hindu and also from India. Her reaction - "It is customary to make an offering to a deity, flowers or fruits or a freshly prepared food item. If none of these items are available, then cash or coins is the next best thing. Offerings are made usually to consecrated images, not usually to a museum exhibits though." Maybe someone didn't thoroughly understand the tradition, or maybe this was the only statue of Ganesha available to them at the time - or, maybe someone just REALLY needed an obstacle removed fast! Whatever the case may be, I wish them much success!